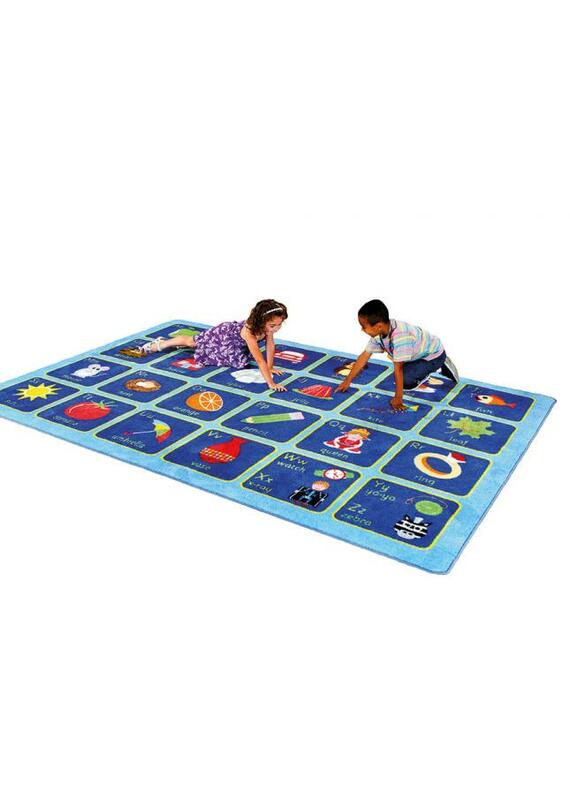 The Alphabet Mat Rectangular classroom carpet is a large rug which has been designed to encourage learning the alphabet in schools, pre-schools and nurseries. This alphabet mat is perfect for children to sit and enhance learning word and letter recognition in a fun and interactive way. Designed specifically with Key Stage 1 Literacy in mind, this colourful classroom rug is perfect for any early years' classroom. The ABC rug features word, letter and picture associations using clearly identifiable Sassoon Infant font in upper and lower case, which is the recommended curriculum font. Manufactured using a heavy duty tuf-pile which is an extra thick, soft textured tufted Nylon twist pile ideal for classrooms and play areas. The specially designed Rhombus anti-slip backing allows you to use the classroom rug on all surfaces. Our classroom carpets are crease and stain resistant and can easily be spot cleaned with a damp cloth. Complete with a 1 year manufacturer’s warranty and conforms to relevant safety standards EN71 Parts 1, 2 and 3. Also available Alphabet Rug Square Classroom Carpet.